Dubai has always graciously hosted events that further the cause of art and literature. Apart from the glitz and glamor of Dubai, this is a beautiful side of Dubai which is highly appreciated by the masses. Keeping in line with this agenda, this year Dubai will welcome the Dubai Canvas Festival 2016 which will bring together artists, local as well as international on to one platform! The Dubai Canvas 2016 takes place from March 1st to 14th, 2016 at Jumeirah Beach Residences (JBR). This is the second edition of the festival that is being managed by Brand Dubai, the creative department of the Government of Dubai Media Office, along with JBR. It is touted as the step towards transforming the landscape of Dubai into an open-art museum which essentially encapsulates the rich diversity and character of the emirate. This festival will essentially feature more than 60 works crated by 30 artists, carefully selected from 14 different countries. According to Mona Al Merri, director-general of the Government of Dubai Media Office, the works of these talented artists will be exhibited on a stretch of 2 Km within JBR. It is an attempt to encourage active public participation and engagement with interesting interactions. The festival, apart from the artwork that will be exhibited will also feature many other events on the sideline such as custom-designed workshops and fun activities for all age groups. The event is marked to entertain everyone, young and old. According to Arif Mubarak, CEO of Dubai Properties’ Asset Management Arm under Dubai Properties Group, the Dubai Canvas Festival is a way to support the directive of His Highness Shaikh Mohammed Bin Rashid Al Maktoum, Vice-President and Prime Minister of the UAE and Ruler of Dubai, to totally convert the emirate into an open-air gallery which can be enjoyed by everyone. Every year a different artistic theme is chosen that represents the festival. 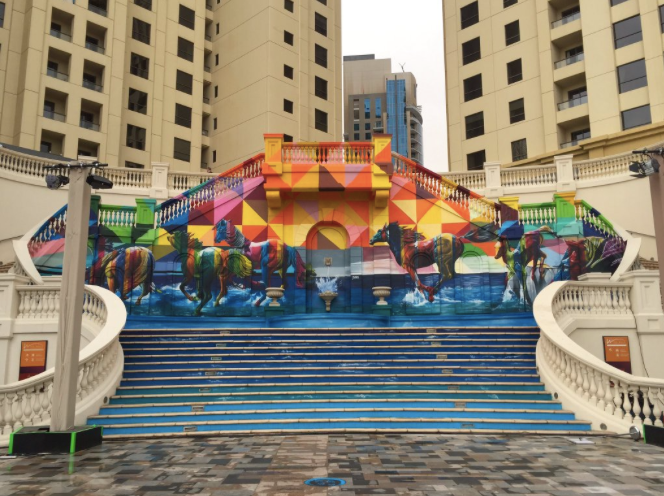 This year round, the theme for Dubai Canvas 2016 is 3D art festival. Patrons will get to witness many optical illusions created by talented international and national 3D artists. The event is specifically focused promote Dubai as a dream destination for artists. The event will be visited by a number of art bloggers, media personalities and a few VIP guests. If you too are an art lover and you wish to enjoy these wonderful creations of talented artists, then you must not miss this amazing event at JBR. Innovative ideas, and interesting creations are the highlight of the festival. Some of the already showcased arts that have been on display at The Walk include a Winter Wonderland, a Under the Sea artwork, a Machu Pichu and many more. Some more amazing art work are still under construction and if you are lucky, you might catch these amazing artists painting on their canvases. Go ahead! Enjoy yourself at the amazing exhibition.